Despite delays, Klamath Basin Geopower plans to move ahead with drilling a second geothermal well in the Olene Gap area, possibly this year. 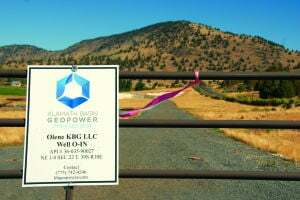 Bill Honjas, Klamath Basin Geopower president and CEO, said the company had hoped drilling would begin by last June but is running behind schedule. Depending on when a drilling permit is approved by the Oregon Department of Geology and Mineral Industries, he said drilling could begin this fall or next spring. Earlier this year the company finished the first well that reached a depth of about 6,000 feet and measured temperatures exceeding 280 degrees off Crystal Springs Road. Honjas said the well can produce up to 2,800 gallons per minute, or about 6.5 gross megawatts of geothermal power. Additional wells are needed to eventually power a 21 MWe power production facility. Based on average estimates, each megawatt provides enough power for about 1,000 single-family homes. If power is produced, it can be distributed to markets in Oregon and California from power switching stations, according to Honjas.